Rose cottage is a recently renovated character cottage that was one of the original cottages of the village of Chideock, which has been, designated a conservation area of Outstanding Natural Beauty. We offer a top quality Bed and Breakfast facility that has been awarded a 4 Gold Star Quality Award with the AA. Our location is within a short distance of West Bay, Lyme Regis and Charmouth. Alternatively you can take a 12-minute meander down the lane at the rear of the property to the local beach at Seatown where you then have access to the Dorset coastal path, the Jurassic Coast and Golden Cap, the highest point on the south coast. A comfortable pretty patio area where you can enjoy a quiet drink. £60.00 per room (Inclusive of Full English Breakfast for Two). £40.00 per person (Single supplement). "Fantastic B & B - after 12 others around Europe this was the best." Anne Marie and Martin , Adelaide. "Lovely place to stay in every way - we will be back." Andy and Pam, Fishponds. "There should be a 5th diamond for your lovely cottage thank you." Ray and Diana, Woodford. "Far beyond all expectations, thank you for your wonderful hospitality." Matt and Earla, Freemantle, Australia. "What a lovely, comfortable welcoming house and couple - we will be back." Tina and Alan, Rainford, Essex. "Our second visit - we love this part of the coast - lovely warm welcome." Nick and Debbie, London. "Lovely cottage, lovely food, lovely atmosphere, we will be back." Alastair and Caroline, Caergwrle. "This was our 4th visit - everything just perfect." Gail and Lee, Woolingham. 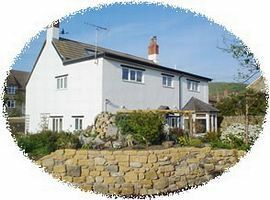 "Thank you Mick and Sue for a real home from home - your place is up there with the top B & B's in South Africa!" Take the A35 from Dorchester until you reach Bridport. Follow the road around the Bridport by-pass and continue towards Honiton. As you come into the village of Chideock you will find Rose Cottage down in the dip on your left-hand side.